The monarch butterflies seen flitting about northern backyards during September are on their way to the Sierra Madre Mountains in Mexico to roost in sacred fir trees (abies religiosa). These monarchs have never been to Mexico, but they will fly there from northern United States and southern Canada to spend the winter. In late winter they will leave Mexico on their northern migration to the southern Gulf States to lay their eggs and then die. This new generation will move a bit northward as spring emerges to the middle part of the country. They will lay their eggs at the end of a short two month lifespan. It will take two or three generations of these short-lived butterflies over the course of spring and summer to make their way northward all the way back to northern United States and Canada to complete their annual lifecycle journey. The special generation born in the north is unique in the monarch life cycle. Their lifespan of seven months is more than double the two month lifespan of generations born in the south, and to facilitate their long flight their wings are longer and sleeker than other monarch generations. 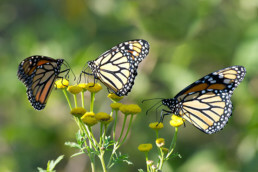 Unlike the multiple monarch generations that follow the warming weather of spring and summer northward and spread out randomly across the north, the southbound monarchs have an instinctive singular goal to rendezvous with millions of monarchs in one general area of central Mexico. Most of the monarchs living east of the Rocky Mountains will make the fall trip to Mexico. They will cluster there on tree branches until late February then begin the northern segment of their migration. If you have milkweeds you could have a monarch emerge from its chrysalis in September, and begin its journey to Mexico from your yard.